The natural products industry can leverage its power to reverse climate change. Climate change is here. We’re already feeling its effects, whether it’s an extended drought, three "hundred year" storms in the span of five years, a maple sugaring season that starts in early January, rising sea levels, or an unprecedentedly vicious hurricane season. In the autumn of 2015, I started to think about this a lot more. OSC2 CEOs were talking about supply chain issues and climate a lot in our monthly gatherings. I was feeling it during a blazing October with my fussy 6-month-old son. Then, Jessica Rolph, a longtime friend and OSC2 member, called me up and asked: "Are you worried? I can smell the wildfires outside my house. OSC2 collaborates on sustainable packaging; could we do it for climate?" And so we started this journey with a question—how could our industry work together? Although climate change is one of the biggest threats humankind has ever faced, it’s also one of the greatest opportunities we’ve ever had to innovate and make change. By joining forces, we can unleash a new wave of innovation that will help slow and ultimately reverse climate change while improving our quality of life and making our businesses stronger. But we must act, we must work on the big opportunities, and we must do it together. That’s why my organization, OSC2, recently joined forces with the Sustainable Food Trade Association to create the Climate Collaborative—a network of natural product manufacturers, retailers, brokers, distributors and suppliers working collaboratively to take bold action on climate change. Fortunately, we are an industry of innovators. We’ve cut our teeth tackling issues like organic agriculture, animal welfare, non-GMO and fair trade practices. Our consumers expect us to lead. Now it’s time for us to lead on climate. Many of the companies in our industry are already deeply engaged in climate actions, but when recently polled, the overwhelming majority of natural foods companies responded: "We could and should be doing more." By collaborating to create momentum and reach scale, we can drive the change that must happen to create a stronger more resilient industry—and a better future for all. We’re partnering with New Hope Network to kick off the Climate Collaborative with the first-ever Climate Day on March 8 at Natural Products Expo West in Anaheim—an event dedicated to spreading hope, sharing new ideas and proven solutions, and making the connections that will help your company make a meaningful impact on climate. I invite you to join us with New Hope, Happy Family, Annie’s, Dr Bronner's, National Co+Op Grocers, Independent Natural Food Retailers Association, Patagonia Provisions, Organic Valley, Nature’s Path, REBBL, Nutiva, Numi, Guayaki, Elk Packaging, White Wave and dozens more industry leaders and nonprofits for this remarkable gathering. 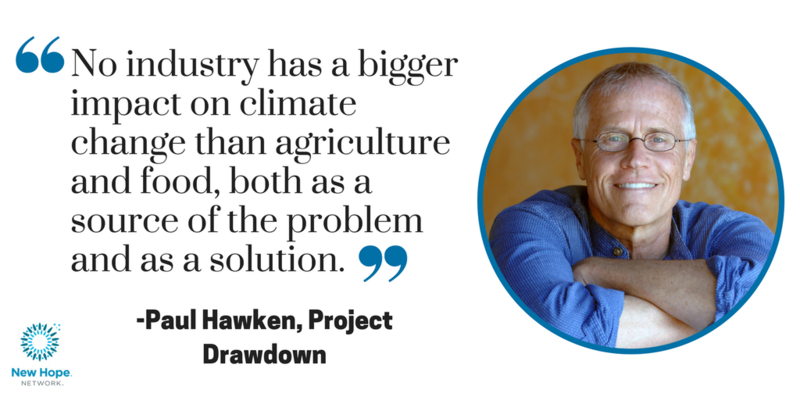 Environmental visionary Paul Hawken will give a keynote address about his inspirational work at Project Drawdown. Birgit Cameron of Patagonia Provisions and Dave Alexander of Global Organics will provide details about agriculture’s vast promise to reverse our current climate crisis. We’ll host a CEO roundtable where you can hear directly from industry leaders like John Foraker of Annie’s, Robynn Shrader of NCG, Chris Mann of Guayaki and Jessica Rolph of HappyFamily about their climate successes and challenges. Joel Makower of GreenBiz will be our emcee for the day, and our reception with food and drinks will offer a lovely time to greet old friends and make new ones. We’ll also be screening Kiss the Ground, a beautiful film on the potential of soils and farming to address the climate crisis. And much more! All Climate Day events are free with your Expo West exhibit hall badge, but space is limited so register soon. It’s clear that climate is the "next big thing" facing our industry, and I know we can and will rise to the challenge.